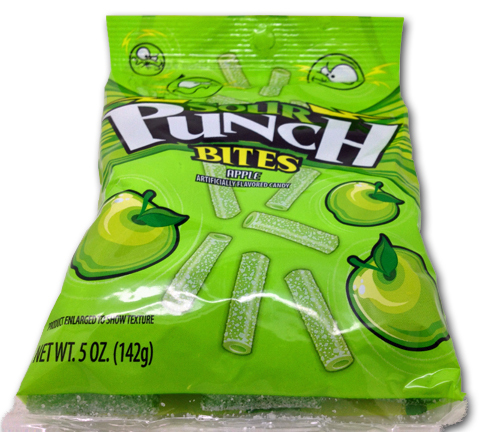 Matty reviewed Sour Punch BITS, not to be confused with Sour Punch Bites, early in 2012. His review was less than glowing. Then I had to go and be optimistic again. Always my downfall. I even bought two bags – green apple and strawberry. 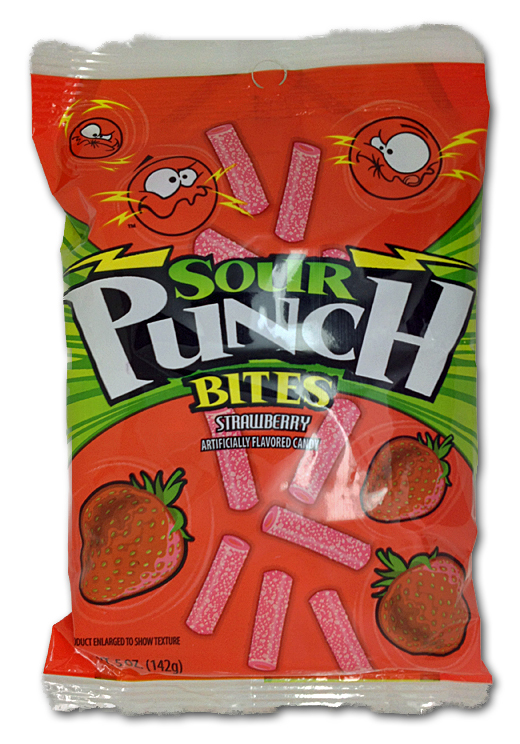 The Candy Gurus were built on crap candy like this. Sour, fruity, chewy, grainy? That’s our thing. Thus, I couldn’t resist. They look like they should be amazing, or at the very east reliable and middle of the road. Not so. To quote the wisdom of George Michael, “I should have known better than to cheat a friend, and waste the chance that I’d been given. So I’m never gonna dance again, the way I danced with you.” Makes sense, right? These are Godawful. To the point where I really think that something’s wrong with them. Breaking it down by problem, let’s start with the consistency. They’re not soft like most candies of this variety. And they’re sure as hell not tough and chewy, a la Haribo. 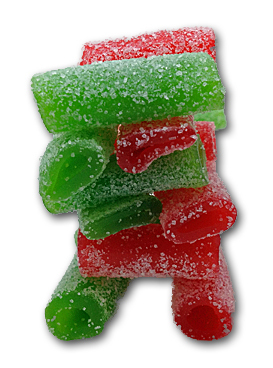 Think more of squid, or of industrial tubing: slick, almost chewy, springy, but more than anything, weird. Not pleasant. I like to think that I can get over consistency issues, and even with these, I probably could, if not for the flavor. Sure, the apple and strawberry flavors are ok : basic, nothing special, but fine. However, there’s a seriously off flavor in both of these that I can only describe as not sweet, but savory. When I tasted them, I felt it was a wheat flavor, but I could be wrong. It was the finishing flavor of the candies for me, which is a deal breaker. 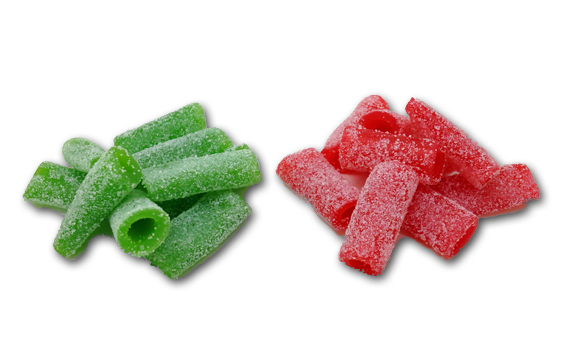 Sometimes an off flavor at the beginning of a taste can be absorbed or forgotten: when it’s the parting memory of the candy, it’s unnaceptable. Yes, I should have re-read Matty’s review and not even bought these. But I can’t help it: I love candy. I’m on a motherblankin’ mission to review every candy I can find, so sometimes there’s gonna be huge misses. The thing I don’t get is that these were in Safeway. I’m guessing it’s HARD to get your candy sold at national food chains. But they accept something like this? Just goes to show that us Americans have no idea what’s up. Speaking of Americans, American Licorice Company makes these. They also make the holiest of holies, Red Vines. I can’t make heads or tails of this. It should also be noted that Jonny Guru Jr. says these are “great”! He’s American. Purchase links below.